Do you have issues with your back? An inversion table can help with a variety of different back problems. These devises are becoming an increasingly popular form of relieving back pain. Back pain is often due to compressed nerves. When the discs in your spine get scrunched together, twisted etc, it can pinch one of the many nerves running through your back. An inversion therapy table works by essentially stretching your back our and helping the discs to revert to their proper position. An inversion table typically has a bench that you lie on, a mechanism for strapping in your feet, and a way to rotate yourself to the desired angle. Some researchers state that 60 degrees is the best angle to work with. Then gravity works it’s magic. 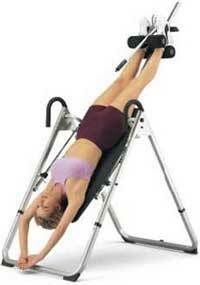 To be truly effective you need to use an inversion table on a regular basis. However, it only takes a couple of minutes a day. Inversion therapy has many other purported benefits besides relieving back pain. It is also said to increase both cardiovascular in lymphatic circulation, increases blood flow to the brain and can increase your flexibility. Typically the only reported side effect from using an inversion table is injury due to going to too extreme of an angle too soon, or for too long. So be sure and read all the instructions before using it for the first time. It is also not recommended for those with heart problems, pregnant, or with other health issues. Therefore, do not self medicate. Be sure and check with your doctor before engaging in inversion therapy – and if you’re interested in using it to relieve back pain, have your doctor run some tests to pinpoint the cause of your discomfort to make sure that inversion therapy would be effective and not cause further damage. However, if you don’t suffer from any other health problems, inversion therapy can be a fantastic non invasive option for relieving discomfort.